My paternal grandfather's family left Ohio in the 1880s and by 1940 there weren't many relatives still around there. One person who was was Mary C. Allen Evans (I have no idea what the 'C' stands for, though I'd love to know). Mary was my great-great-grandfather's older (by fourteen years) sister. She married Thomas J. Evans when my great-great-grandfather was a baby. They had six children. At the time of the 1940 US Census, she was living in Girard, Trumbull, Ohio where she had spent most of her life. She died on 30 April 1940 (72 years ago today), eighteen days after the census enumerator visited her home. Interestingly, Mary is listed as completing the 8th grade. This would mean she was likely in school until not long before her marriage. Considering she came from a poor family with many mouths to feed, I'm a little surprised she got as much education as she did. About a week after she spoke with the enumerator, she began seeing a physician for 'carditis,' which she later died from (as well as old age, she was 85). 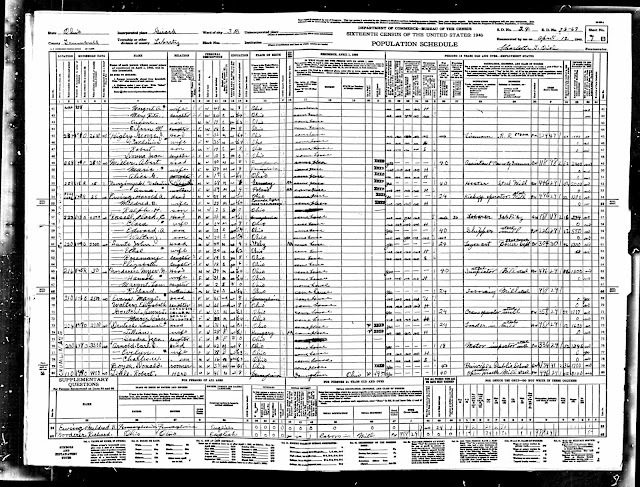 I think it likely the 1940 US Census was one of the last (if not the last) record Mary helped create. A Find and a Surprise!